Luni is a major west-flowing river that originates from western slopes of Naga hills, at an elevation of 772 m in Ajmer district of Rajasthan, where it is known as the Sagarmati. After passing Govindgarh, it meets its tributary Sarsuti, which originates from Pushkar Lake, and from then on it is referred to as Luni River. The name Luni is derived from the Sanskrit word lavanavari (“salt river”) and is so called because of its excessive salinity. The Luni river is not saline until it reaches Balotra, where high salt content in the soil impacts the river. Luni River originates in Naga Hills of Aravalli Range, near Pushkar valley in Ajmer district. At Govindgarh it meets its tributary Sarsuti and travels in north-western direction towards Nagaur. Luni takes a turn and starts flowing in southwest direction through the aravalli hills in Pali and reaches plains of marwar region in Jodhpur. It continues in the same direction into Barmer and Jalore, eventually discharging into Rann of Kachchh, Gujarat. At Rann of Kutch, Luni forms a delta where the water spreads out and does not contribute any runoff. The total length of Luni is about 511 kms. The Luni basin is bounded by Aravalli range and Gujarat plains on the east, by Rajasthan desert on north, and by the Arabian Sea on the south and the west. 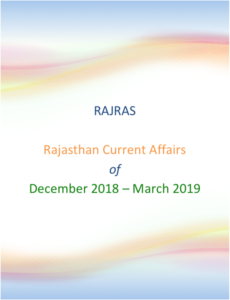 The total area of Luni basin is 32,879 Sq.km and includes several parts of the Ajmer region from Nagaur to Pali and then moving towards Jodhpur and Barmer before its entry into the Jalore district. The main tributaries of Luni joining from left are the Lilri, the Guhiya, the Sukri, the Jawai, the Bandi (Hemawas), the Khari Bandi, the Sukri Bandi and the Sagi. Jojri is the only major tributary that joins the luni river from right. Jawai originates from the Aravalli Ranges in the Udaipur district of Rajasthan. 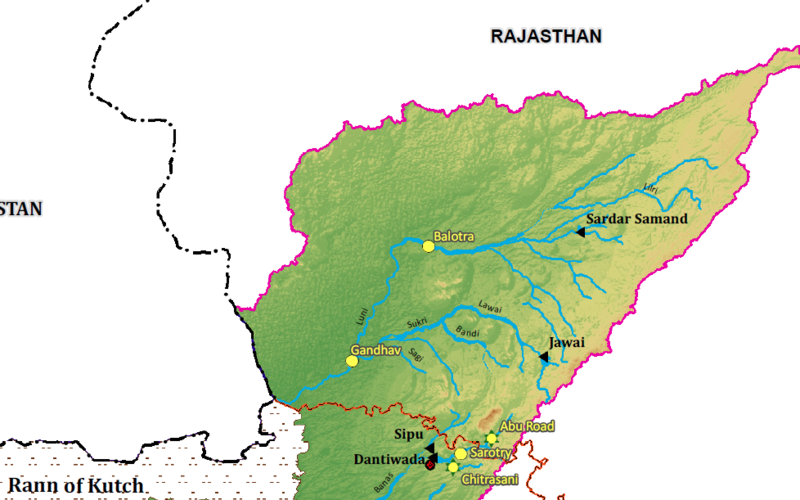 Main tributaries of Jawai are Sukri and Khari river. Twin cities of Sumerpur and Sheoganj are situated on the banks of this river. The Rivers Khari and Mithai meet at pickup weir of Bombadra. This confluence gives rise to the Bandi River. After flowing for about 45 km, it joins the Luni near the Lakhar village. The Hemawas dam is located near Hemawas on this river. The district headquarters Pali is located on the bank of Bandi. Sukri river originates from the western slopes of Aravalli Range in Pali District and flows through Jalore and Barmer before merging with the Majal in Luni river. Bankli Dam is located on this river in Jalore District. Guhiya River is a small river in Pali, which runs only during the monsoon season. It rises in the foothills of the Aravalli Range near the villages of Khariya Neev and joins the Bandi River near the village of Phekaria. In 1892, Maharaja Jaswant Singh of Jodhpur constructed Jaswant Sagar in Pichiyak village, Jodhpur district to use the waters of Luni river.